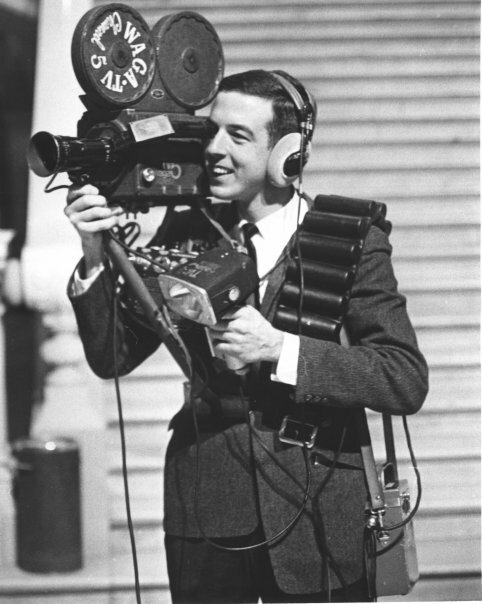 The answer is clear: He’s about to commit acts of television with his hifalutin’ state-of-the-art TV gear, circa 1967. 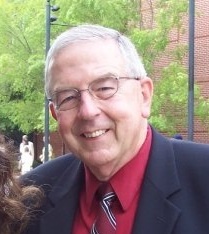 This fresh-faced youngster is Dan Keever, ex-WAGA photog turned UGA / Grady College TV guru. During his career, Keever hauled around everything from a CP-16 film camera to a TK-76 3/4″ tape camera to a Betacam. But he’s got a soft spot in his heart for this sweet little jewel, which predates the CP-16. “That’s an Auricon 600 studio film camera. It weighed 45 pounds – just the body,” Keever writes. The photo was shot inside the state capitol in Atlanta. Keever was about to apply his craft with 400 feet of black-and-white magstripe 16mm film. “The magazine was made to hold 600 ft but we shot 400 ft loads. The empty magazine weighed 15 pounds by itself,” says Keever. “When I was shooting, the shoulder brace held the camera pretty well. I preset the audio, and held the light as far away from the camera as I could. (I used to advocate that shooters be outfitted with a third arm.) I tried to use a tripod as much as I could. Reporter Phil Flynn carried it. “The Auricon ran on AC, so the power pack hanging from the shoulder had a converter built into it. The batt belt just ran the light and like any battery it lasted until just before you REALLY needed it,” Keever writes. He’s wearing a suit because Keever and Phil Flynn covered the Capitol as a bureau. Each of them trolled for stories and produced them for air. “We were also reporters and would have to do our own standup shots. 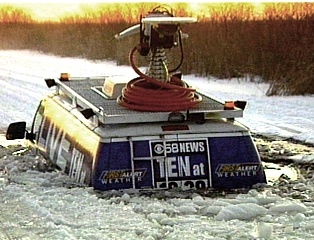 We were a staff of 12 trying to look as big as the 25 person staff of WSB-TV.” The suits obviously took a beating under that load of gear, and then some. What Keever calls “blessed relief” came nearly a decade later with the comparatively lightweight CP-16. But the advent of videotape brought its own horrors: The Ikegami HL-33. Writes Keever: “The camera head, which had a flat bottom that was very uncomfortable, weighed 33 pounds. The backpack that was attached by a heavy multi-conductor cable, contained a large part of the circuitry for the camera and a 25 pound battery and weighed a total of 60 pounds. This entry was posted in WAGA on January 4, 2010 by live apt fire. In the photo, Dan Rather has just told Dan Keever to get that ##@%** camera out of my face! Regarding the use of film to shoot football games, one news director told me to only shoot the touchdowns to save film. Thank you Doug for this post! I’m a former student of “Professor Keever” now working in the biz. By the time I got to his UGA class, he was teaching us how to one man band shoot on mini DV cams. My, how things have changed, but yet stayed the same. His mug hasn’t changed in 40+ years! Congratulations Keever on the induction! So, Dr. Dan, what was larger, the cost of chiropractic care or the back surgeries? Saw that first picture and thought, this guy looks familiar. What a hoot! Hats off to Captain Keever – a great photographer and professor. 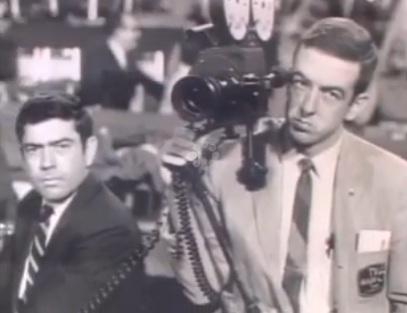 Am I crazy or does a young Dan look a little like a thin Edward R. Murrow? Congratulations, Professor Keever! Between lugging a small car on your shoulder and inhaling diesel fumes for decades it’s amazing you’ve survived for a second career! @ Dale Russel: Am I crazy or does a young Dan look a little like a thin Edward R. Murrow? There’s something in the water here at the CBS Broadcast Center on West 57th St. in NYC. You should see what Katie looks like without makeup. I’m a former Keever student, and in my opinion, the most incredible part of all this is the fact that the man changed with the times so fluidly. Looks like he was every bit as deft handling this equipment in 1967 as he was teaching me how to film on mini-DVs and edit on Final Cut Pro in 2005. I learned a helluva lot from that man, and I appreciate the incredible Grady faculty to this day. Thanks, Keever, and congratulations on your recent induction into the Silver Circle! Great Post! My name is Christelle Le Faucheur, I am the News Media historian at the Briscoe Center for American History. I am working on a project about the career of Mr. Dan Rather and I was wondering if I could use the picture of Mr Rather , and if so if you could send me one in higher resolution. Best.